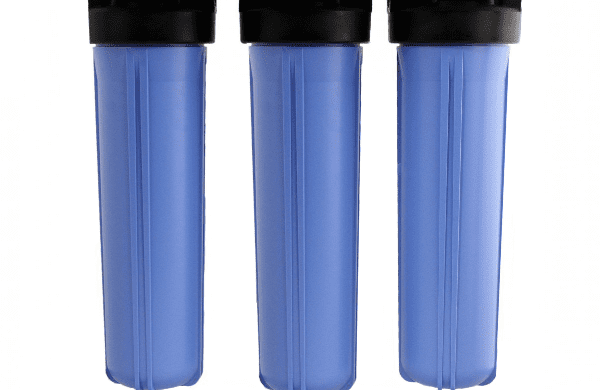 As more people are becoming aware and concerned about the chemicals both intentionally and (perhaps) unintentionally in our water, we’ve been hearing from more people looking for a “Whole Apartment” or “Whole Condo” water filter solution. We have them available. This design was developed for one of our good customers who has a condo in New York City. It has been used in many similar situations, but also in single family homes with low water usage and/or not much space to put in a whole house filter. If you condo or apartment has its own water heater, you can get just one of these systems. If however, you do not, and you have both hot and cold water pipes to your place, then you will need to get two units. One is for the cold water line, and one for the hot water line. Of course, in this instance, the filtration media will last twice as long in each, as you are not running all the water through the filter. All of the filter material in these systems has been processed using the patented method the FOAM ADVANTAGE. This greatly increases the effectiveness of the media, which have been powderized and shaped into disks. This means far less filter material is needed, and therefore you can get filtration the equivalent of much larger systems. It is an elegant solution. There are options available for your circumstances, including chlorine, chloramine, and fluoride removal. Please note that the core configurations do not include a pre-filter. We recommend you add one of these inexpensive sediment filters to protect the more expensive media in the main system. This is a great solution if it meets your needs. Please note however, that larger systems can go a longer time before needed to have the media changed. If you need help to select the best system for your situation, please email us at [email protected] Knowing what town and state you live in is part of the information we need to identify the best options for your home.